Sang-sol, also known as incense offering, is a culture practised over thousands of years by Tibetans across Tibet. It is not only an individual but a national custom where people perform the ceremony with prayers and incense burning. During the resistance war, Tibetan fighters performed San-gsol to ward off the negative forces of China’s invasion. Despite China’s ongoing oppression and occupation in Tibet, Tibetans continue to carry out Sang-sol to this day. Every Wednesday, which is the soul day of His Holiness the Dalai Lama, Tibetans everywhere perform Sang-sol to pray for his long life and his soon return to Tibet to his people once again. Last week in 6th July, on the 76th birthday of His Holiness which was also a Wednesday, I had the opportunity to be a part of the Sang-sol in Dharamsala where tibetans from all walks of life gathered at the well-known Sang-sol site called Lhagye Ri in the wee hours of the morning. With people, some busy turning the prayer wheels & some burning junipers & incenses, the ceremony began with a session of prayers followed in between by the unmistakable bhoe-ja (butter tea) and drey-si (sweet rice) afterwhich people filed in a queue with hand full of tsampa (barely) where, after three chorus of prayers, it was thrown into the air with trails of white tsampa later falling down gently as a blessing from above. 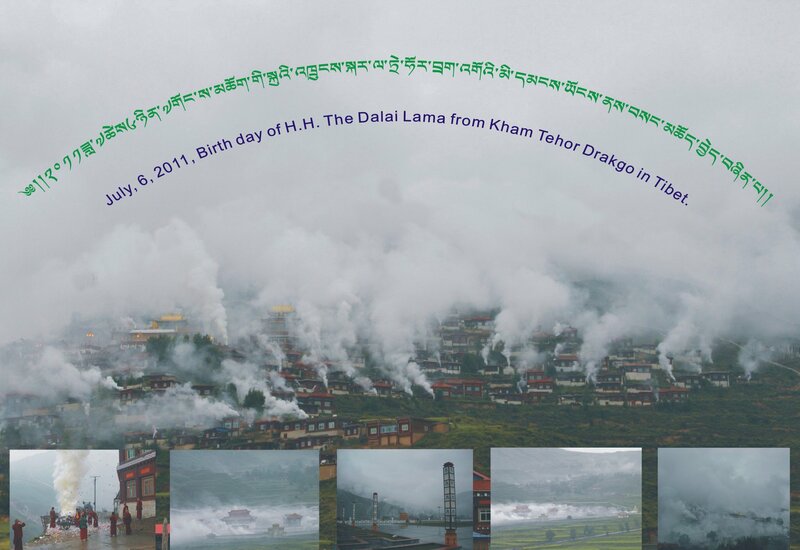 In Tibet, despite the ongoing crackdown in Kardze, tens of thousands of Tibetans in Tawu celebrated the 76th birthday of His Holiness the Dalai Lama with plumes of Sang-sol smoke rising from households everywhere. Tibetans came out in resitance and confronted the Chinese security personnel with Tibetan national flags and raised slogans calling for the return of His Holiness the Dalai Lama and religious freedom in Tibet. “We further resueqt that the Prime Minister state on record that his meeting with the Dalai Lama will include a discussion of how the United Kingdom can help Tibetans find a solution to the Chinese occupation which began in 1950.”They might ask for Taiwan in exchange. After all, we acknowledge that Taiwan is Chinese. I wouldn’t count on China surrendering territory to us just because we ask nicely.Bearing in mind our business relationship with the Chinese, I’d also be somewhat surprised if Brown called on China to return Tibet.